I just read an article that says that apparently, tablets are 'coming back'. Which will be interesting if true. If I were in the market for a tablet (and I just might, depending on how things shake out in the next bit, especially with O on the horizon) it might just be with this Samsung Tab S3. I've really liked some of their tablets in the past, and having one with a pen is almost a must for me. Designed with Purpose, the Galaxy Tab S3 is a powerful performance device for an immersive entertainment and gaming experience. 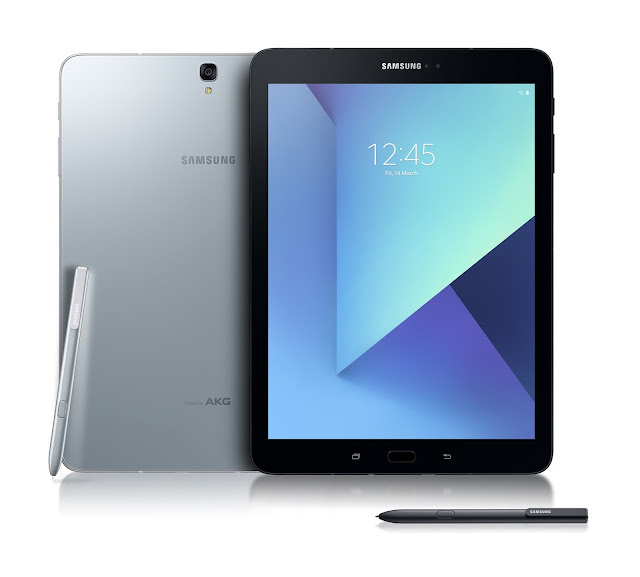 Mississauga, ON – March 24, 2017 – Samsung Electronics Canada Inc. today announced the Canadian launch of the Galaxy Tab S3, a tablet that elevates the mobile entertainment and gaming experience. Fusing glass and metal together for a sleek premium design, the Galaxy Tab S3 is the first Samsung tablet to feature quad speakers tuned by AKG by HARMAN and a Super AMOLED display with HDR video compatibility, offering a cinema-like experience from your personal tablet. The Galaxy Tab S3 is ideal for entertainment use and is fully optimized for use by gamers. The tablet is equipped with Game Launcher, which has an enhanced user interface to provide excellent gameplay on a tablet, and also includes features such as the Do Not Disturb Mode so you can play your favourite games without interruption. Plus, the Galaxy Tab S3 supports Vulkan API for vivid and superior graphic technology and instant access to all your favourite games with the Galaxy Game Pack. • Cinematic Experience: Quad speakers with immersive sound, Super AMOLED display with 4K video playback and HDR video compatibility make the Galaxy Tab S3 an outstanding entertainment device. • Pen with precision: For a natural writing experience, the advanced S Pen has a smaller 0.7mm tip and increased pressure sensitivity, and requires no charging. Write notes, draw pictures, edit videos, or translate text and even jot something down when the screen is locked. • Simple connection, flawless typing: Do more by simply attaching the magnetic keyboard to the Galaxy Tab S3. The optimized layout and increased space between keys helps to eliminate errors for an enhanced experience on a tablet. *Magnetic keyboard sold separately.